The Fortnite Challenges for Week 7 of Season 8 seem a little less imaginative than normal but are still needed if you want to unlock the secret Battle Star. As always, fans need to complete all of the current challenges to unlock a new Loading Screen. This Loading Screen includes a secret clue that will help fans track down this week’s Fortnite Secret Battle Star. And while the new challenges for week 7 are pretty weak, the Loading Screen is pretty sneaky. Having dealt the damage and searched the chests, Fortnite gamers will then be able to uncover the secret Battle Star. While it may sound complicated and not worth, fans who do go to the effort will have something special to do at the end of the season. A new skin will be unlocked, and it doesn’t look like it will be ruining anyone’s final weeks of Season 8. Having completed the new challenges, you will unlock a new Loading Screen, featuring the Tier 100 skin, Luxe. There’s a bit of tomb-raiding going on in the picture, along with a sneaky cave painting hidden in the background. It’s hard to make out exactly what it is as it appears to be an object turned on its side. But internet sleuths have worked out that it is a giant rabbit with the secret battle star on its back. And for anyone who has played the game for a long time, they will know that means heading to one large wood structure near Snobby Shores. That means heading to the A-4 Map coordinate and landing yourself on the big bunny itself. The secret battle star should be available to collect on its person. 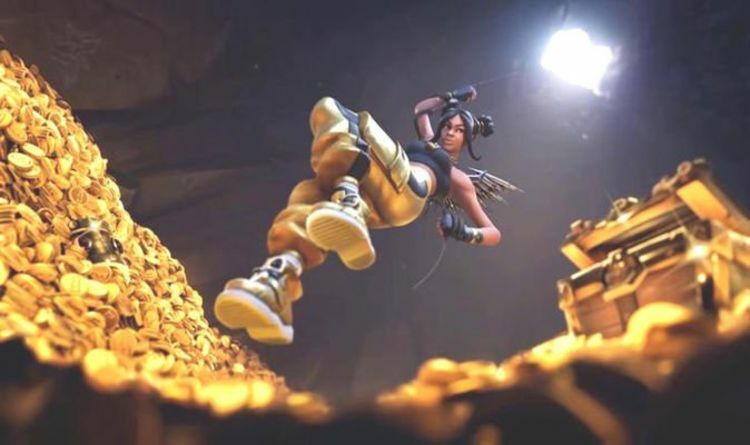 Why Epic Games decided to pair such a hidden clue with a somewhat disappointing list of challenges is anybody’s guess. The Battle Star itself is well worth the effort as it will help you unlock a full tier, a great bonus so close to the end of the current season. It’s unclear if Luxe will be part of the final build-up to the end of Season 8, or if she was just included to feature her. The Pirate Camps are probably the most difficult part of this week’s challenges and can be spread out across the map. In total there are seven pirate camps for Fortnite fans to find on the Battle Royale map. These are evenly distributed around the map, and the locales also tend to have pirate flags hoisted up and flying which makes them easy to spot.